We keep seeing the same liberal argument being played over and over again. As the mainstream media seek to make their case to the American people that the Bush tax cuts should expire, one of the primary strategies being employed is to claim that Republicans are refusing to “pay for” their extension of the tax cuts. And that therefore the Republicans will hike the deficit. The problem is that it’s a false premise, based on a static conception of human behavior that refuses to take into account the fact that people’s behavior changes depending upon how much of their money they are allowed to keep, and how much of their money is seized from them in taxation. As bizarre as it might seem, it is seen as perverse these days to suggest that allowing someone to keep more of the money he or she invests would stimulate people to take more risks by investing in businesses and products, and that such increased investment in business and products would in turn stimulate more economic growth. Common sense has become akin to rocket science these days. Then again, liberals aren’t doing much for rocket science, either. Let’s take a look at the current facts, and then examine the history of our greatest tax-cutting presidents. Democrats say they are cutting taxes on “95% of Americans, but argue that giving the same tax cut benefits to the remaining 5% would hike the deficit and be fiscally irresponsible. Well, for one thing, the Democrats are flat-out lying when they say they are cutting taxes for 95% of Americans. That can’t possibly be true, because as a matter of simple fact a whopping 47% of American households pay no federal income taxes whatsoever. WASHINGTON (AP) — Tax Day is a dreaded deadline for millions, but for nearly half of U.S. households it’s simply somebody else’s problem. A tax cut is a reduction in the percentage or amount of taxes that is being imposed on a citizen. The government is cutting the amount it had been collecting from taxpayers. A government cannot “cut” a citizen’s taxes unless that citizen had been paying taxes in the first place. What Obama and the Democrats in Congress propose is NOT a “tax cut.” And it is nothing but a lie to call it that. And every single journalist who has suggested that it is a tax cut is as much of a liar as the Democrats are. That’s the first point. Democrats are advancing a central tenet of Marxism and deceitfully and even demagogically relabeling it as “capitalism.” And the media helps them get away with it. Next comes the idea Democrats argue that tax cuts for the rich contribute to the deficit. Let’s say for the sake of argument (just for the moment; I’ll prove it’s wrong below) that tax cuts for the rich raise the deficit. Let me ask you one question: how then do tax cuts for the rest of us not ALSO raise the deficit??? Why wouldn’t raising taxes on the middle class and the poor not correspondingly lower the deficit? So why aren’t Democrats going after them? Are Democrats too stupid to realize that there just aren’t enough rich people to pay off our deficit, especially when this president and this Congress have raised said deficit tenfold over the last Republican-passed budget deficit? The last budget produced by congressional Republicans was in 2007. That year, the deficit was approximately $160 billion; now under Obama, Nancy Pelosi and Harry Reid it is $1.6 TRILLION a year as far as the eye can see. Wouldn’t ANY tax cuts raise the deficit? And shouldn’t we therefore tax the bejeezus out of EVERYBODY to lower the deficit? Wouldn’t every single dollar collected reduce the deficit correspondingly? Update, Sep. 10: A study by the Joint Tax Committee, using the same static methodology that I refer to in my opening paragraph, calculate that the government will lose $700 billion in revenue if the tax cuts for the top income brackets are extended. And that sounds bad. But they also conclude that the Bush tax cuts on the middle class will cost the Treasury $3 TRILLION over the same period. If we can’t afford $700 billion, then how on earth can we afford $3 trillion? And then you’ve got to ask how much the Treasury is losing by not taxing the poor first into the poorhouse, and then into the street? And how much more revenue could we collect if we then imposed a “street” tax? [end update]. Hopefully you get the point: if tax cuts for the rich are bad because they increase the deficit, then they are equally bad for everyone else for the same exact reason. And so we should either tax the hell out of everyone, or cut taxes for everyone. And a consistent Democrat opposed to “deficit-hiking tax cuts for the rich” should be for raising YOUR taxes as much as possible. Republicans don’t fall into this fundamental contradiction (see below), because they don’t believe that tax cuts create deficits. Democrats do. Which means they are perfectly content with shockingly supermassive deficits – as long as its 95% of Americans who are creating those deficits, rather than 100%. Joe Biden said it was a patriotic duty to pay higher taxes. And yet Democrats are trying to make 95% of Americans unpatriotic traitors who don’t care about their country? Which is to say it’s NOT fair at all. Paul may think it’s fair, but poor Peter gets screwed year after year. And it is a fundamental act of hypocrisy – not to mention advancing yet ANOTHER central tenet of Marxist class warfare – to claim to oppose tax cuts for the rich in the name of the deficit, but not to oppose tax cuts for everyone else. And for the record, I despise both hypocrisy AND central tenets of Marxism. Which is why I despise the Democrat Party, which is both hypocritical and basically Marxist. And, again, that mindset about government control and in fact government ownership over people’s wealth represents a profoundly Marxist view of the world. [End update]. For what it’s worth, Democrats will only maintain the massive contradiction of “tax cuts for the rich raising the deficit” for so long. Obama already admitted he was willing to go back on his promise to raise taxes on the middle class. And his people are already looking to tee off on middle class tax hikes. In addition, if you have any private retirement funds, they may well be coming after you soon. As a result of the Clinton-era Dot-com bubble bursting, the Nasdaq lost a whopping 78% of its value, and $6 trillion dollars of wealth was simply vaporized. We don’t tend to remember how bad that economic disaster was, because the 9/11 attack was such a huge experience, and because instead of endlessly blaming his predecessor, George Bush simply took responsibility for the economy, cut taxes, and fixed the problem. The result, besides the above tax revenue gains, was an incredible and unprecedented 52 consecutive months of job growth. Update September 12: Did somebody say something about “jobs”? Another fact to recognize is the horrendous damage that will be done to small businesses and the jobs they create if the tax cuts for the “rich” aren’t continued. As found in the Wall Street Journal, “According to IRS data, fully 48% of the net income of sole proprietorships, partnerships, and S corporations reported on tax returns went to households with incomes above $200,000 in 2007.” Further, the Tax Policy Center found that basically a third of taxpayers who are expected to be in the top tax bracket in 2011 generate more than half their income from a business ownership. And while Democrats love to point out that their tax hikes on the so-called rich only impact 3% of small businesses, the National Federation of Independent Business reports that that three percent employs about 25 percent of the nation’s total workforce. “Small businesses that employ 20 to 250 workers are the most likely to be hit by an increase in the top two tax rates, according to NFIB research. Businesses of this size employ more than 25 percent of the U.S. workforce.” So if you want jobs and an economic recovery, you simply don’t pile more punishing taxes on those “rich” people. Especially during a recession [End update]. We’re not arguing theories here; we’re talking about the actual, empirical numbers, literally dollars and cents, which confirms Andrew Mellon’s thesis, and Warren Harding’s and Calvin Coolidge’s, John F. Kennedy’s, Ronald Reagan’s, and George W. Bush’s, economic policies. Harding and Coolidge, Reagan and Bush, with Democrat JFK right smack in the middle: great tax cutters all. The notion that small- and limited-government conservatives who want ALL Americans to pay less to a freedom-encroaching government are somehow “beholden to the rich” for doing so is just a lie. And a Marxist-based lie at that. 1988: top 1% of earners paid 27.5% of all personal income taxes (+ 10%). 1988: top 10% of earners paid 57.2% of all personal income taxes (+ 9%). So rich clearly paid MORE of the tax burden when their tax rates were LOWERED. 1988: middle class paid 48.7% of all personal income taxes (- 9%). The middle class’ tax burden went DOWN by 9%. They paid almost 10% LESS than what they had been paying before the Reagan cuts. 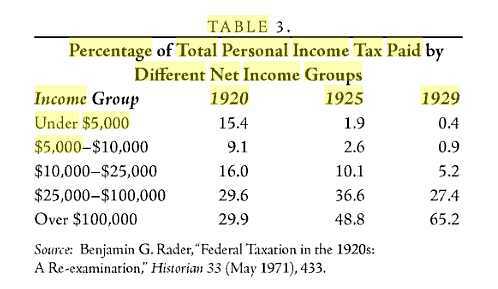 1988: bottom 50% paid 5.7% of all personal income taxes (- 2%). So the Joint Economic Economic Committee concludes that if you lower the tax rates on the rich, the rich wind up paying MORE of the tax burden and the poor end up paying LESS. When you enact confiscatory taxation policies, the people who can afford it invariably end up protecting their money. They do everything they can to NOT pay taxes because they are getting screwed. When the rates drop to reasonable rates, they don’t shelter their money; rather, they take advantage of their ability to earn more – and improve the economy by doing so – by investing. If you take away their profit, you take away their incentive to improve the economy and create jobs.